Investors dumped Glencore as fast as they could earlier this week but the company's directors and senior executives are pouring millions into the struggling commodities giant. The shares collapsed by 29% on Monday, forcing the mining and trading conglomerate to dismiss market talk that it was at risk of going under. Three directors, including chairman Tony Hayward, have rallied around the company's stock since then, buying more than two million shares worth about $3 million. Hayward, a former BP (BP) CEO, was joined by fellow directors John Mack, former CEO of Morgan Stanley (MS), and William Macauley, the private equity billionaire. 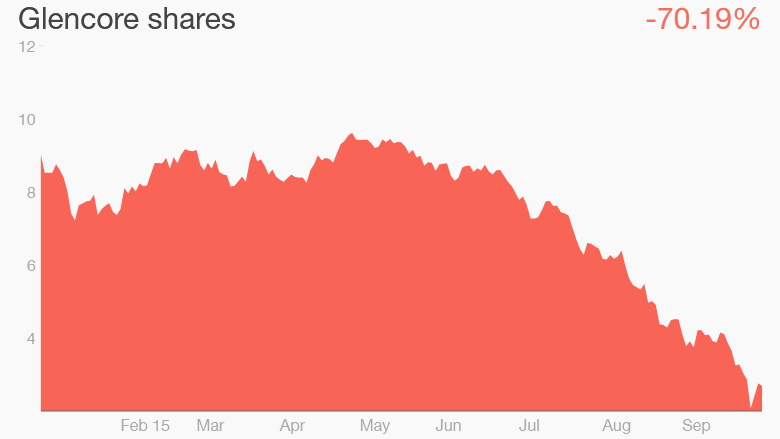 Shares have recovered most of the ground lost earlier this week. On Friday, they were trading nearly 4% higher at 94 pence ($1.4). But the stock is still down nearly 70% since the start of the year, and more than 80% since it was listed at £5.30 a share just five years ago. Glencore (GLCNF) has been crushed by falling prices for commodities and fears that China's slowdown will make matters even worse. It borrowed heavily to invest when commodity markets were booming, and is now struggling to service its huge debt. Analysts say global commodity prices are unlikely to recover substantially until at least 2018, meaning more pain ahead for the company and its backers. They're also worried that Glencore might suffer even more if U.S. interest rates rise soon. That's because commodities are traded in dollars. If the dollar strengthens because of higher U.S. rates, prices for metals and other materials may fall further to compensate. The vote of confidence by the company's directors may have helped steady market nerves this week, but Glencore faces a long hard road to recovery. It has embarked on a major restructuring plan aimed at raising $10 billion so that it can reduce debt to nearer $20 billion by the end of next year. It has halted dividend payments to shareholders, slashed investment, suspended some copper production in Africa, and is raising $2.5 billion by issuing new shares. The directors, and senior executives, are digging deep into their own pockets to help fund that capital increase too. CEO Ivan Glasenberg, who already owns about 8% of Glencore, the group CFO and several board members agreed last month to buy $550 million worth of new shares. They're already sitting on a notional loss of about $126 million on those shares alone.